"One learns first of all in beach living the art of shedding; how little one can get along with, not how much." ~ "Anne Morrow Lindbergh"
The cottage is also available as a 3 bedroom 2 bath option with expanded living and dining spaces increasing our occupancy maximum to 6. Perfect for families traveling with extended family or teens. VRBO #1083271- we'll be happy to upgrade your reservation. VRBO # 1083271- contact me anytime to discus options. One of a kind *PRIVATE* beach cottage. There's nothing like Paradise Found Florida on the barrier island. Paradise Found Florida is a stand alone cottage with a private backyard and direct access to the beach. Explore Melbourne Beach Florida- miles of unspoiled beaches, nature preserves, and endless summer relaxation! Off shore, breezes make for year round enjoyment of the tropical climate. Precious Get Away, Breathtaking, Paradise Found A Great Name For A Beautiful and Tranquil Location, Our Slice of Heaven, Awesome Family Rental, A Cozy Get Away, Paradise Was Truly Found. PARADISE FOUND FLORIDA-ON THE OCEAN LOCATED IN BREVARD COUNTY'S OLDEST BEACH TOWN- MELBOURNE BEACH. •	The light and airy interior is just the beginning and out your back door is a magnificent beach and ocean. •	The cottage is the perfect place to get away from it all and is equipped with modern amenities for a relaxing beach escape. •	Paradise Found is the perfect place to create wonderful memories to last a lifetime! Family, friends, kids, teens, and adults- this is a magical place. Something for everyone to explore: Shell hunting, turtle watching, or a lazy day in the hammock under the Sea Grape tree reading and snoozing while the ocean breeze gently embraces and cools you. •	Family Room, Kitchen/Dining, two bedrooms, 1 bath, private outdoor shower with hot and cold water. •	Mexican tile throughout and professionally decorated with a Florida feel. •	We keep plenty of towels and linens on hand and the kitchen is well equipped for creating meals. The green egg cooker is sure to enhance your outdoor dining experience. Settle in and in no time you will feel like this has been your family BEACH COTTAGE for years. •	We continually strive to provide our guests with the best experience possible. •	Quality linens, bedding, and amenities are our hallmark. •	Earning our guests loyalty is our focus and accommodating return guests is our pleasure. We maintain a well- stocked cottage for guest’s convenience and we’re happy to take special requests. •	Stocked beach closet holds chairs, umbrella, toys, and many other items for enjoyment during your stay. •	Plenty of kitchen essentials and extras. •	Fishing, swimming, and shelling out your back door. Hop on a bike ride down to the inlet and explore the nature trails at the Barrier Island Center. For the adventurer ride to Honest John's Fish Camp and take a step back in time. A great place to explore the Indian River where the wildlife abounds: Dolphin, Manatee, Otters and plenty of tropical birds. Near Cape Canaveral, antique shops, golf, and guides available for fishing the Indian River or the Atlantic Ocean. Disney is a short 90 minutes across the Beach Line. Paradise Found is a 'happy' accident! I (Julia) grew up in the Sebastian/Vero area and loved being a child on the beaches here. My parents have always lived in Florida, but my life has taken me in several different directions. Joe and I were fortunate to find this special place and we are now so pleased to share it with our guests It truly is 'Old Florida' and a slice of Paradise. There is nothing more special than having a wonder of nature at your door step. The Atlantic Ocean is a mighty and powerful thing full of interest and wonder. The beauty of the area abounds. Each season brings it's own special circumstances: Fishing, shelling, birds and the magnificent turtles that have nested here for centuries. Looking over the ocean and viewing the manatee, dolphins, fish and the occasional whale are truly spectacular. Of course just relaxing and pondering over the energy the ocean creates isn't bad either. The life force of the ocean is ever evolving and to have the chance to be apart no matter how short is priceless. The unique benefit of this property is a virtually private beach. This truly is 'Old Florida'. There are no high rises, commercial traffic or other distractions. This is a very private part of the beach with private access. Yet! You are close to the things you want. Shopping and necessities are a short drive or bicycle ride. Historic sites are close by: Sebastian Inlet, The Cape and even the Orlando theme parks are within an easy commute. It's the best of both worlds. The guest unit provides a private accommodation with exclusive amenities of a stand alone property- while maintaining affordable beachside accommodations. 1 full bathroom with shower/tub and 1 Private Outdoor Shower with hot and cold water. We're on the ocean - can't get any closer. The cottage is located directly on the ocean with private beach access and a lovely palm shaded grass back yard. Unspoiled beaches waiting to be explored. An abundance of wildlife, fish, birds and sea turtles. Steps from the cottage. All linens including beach towels are provided. Washer/Dryer and laundry supplies on property. Large capacity top loading HE washing machine with laundry supplies. We recommended using Tide pods free and clear. Large capacity multi function dryer. The beach house dining area will seat four comfortably and the courtyard will seat an additional four + picnic table for outdoor dining. Library with great beach read books for the whole family. Digital music channels available through cable TV, apple TV will play all iTunes libraries. We also provide a water proof blue tooth speaker for outdoor enjoyment. Spacious private back yard. Plenty of shade and lounge areas. We even have a hammock for an afternoon under the sea grape tree. Several well known gold courses are close by. Aquaria is an executive course and Spessard Holland is a full 18 hole course spanning the Indian River. Beautiful Linens, 2 Bicycles, boogie boards, beach chairs, umbrella, towels. We have bottled water available for our guests to enjoy. And a private outdoor shower with hot and cold water. We provide an Apple TV and an iPad at the cottage for your use to access some of our favorite apps. Our family had an amazing vacation at the pink house! It was absolutely perfect! Thank you! The pink house provided our family of five with everything we could possibly need. We received prompt responses from the owner and she created a beautiful space for our vacation. We already have our next vacation booked at this special home! Great oceanfront cottage on a beautiful and quiet beach. We hope to stay there again in the future. Had a wonderful week at Paradise Found. Perfect cottage right on the beach! The cottage has everything you need & the beach is beautiful. The beach was almost empty the whole time I was there, which was great! Great place to stay, you will love it. Pet friendly too! As advertised a beautiful cottage on the beach. Owner Julia very helpful when we called with small issue. Definetely will come again! This was the best jewel in all of Florida private beach entrance never crowded private setting great for relaxing and getting away from stress. I wanted a getaway, off the beaten path, a place not a part of big hotels or crowded resorts. This is just far enough away, still close to stores and places of interest, beach was perfect, only a scattering of others if you discount nightly assault by sea turtles coming ashore to lay eggs. House was just great, had everything we needed, outdoor shower was the best, closer to the beach than some photos imply, perfect for sounds of surf, most relaxing week I ever had at a beach. Grateful to owners for preserving such a wonderful piece of old Florida for us to enjoy. Can't wait to come back again. 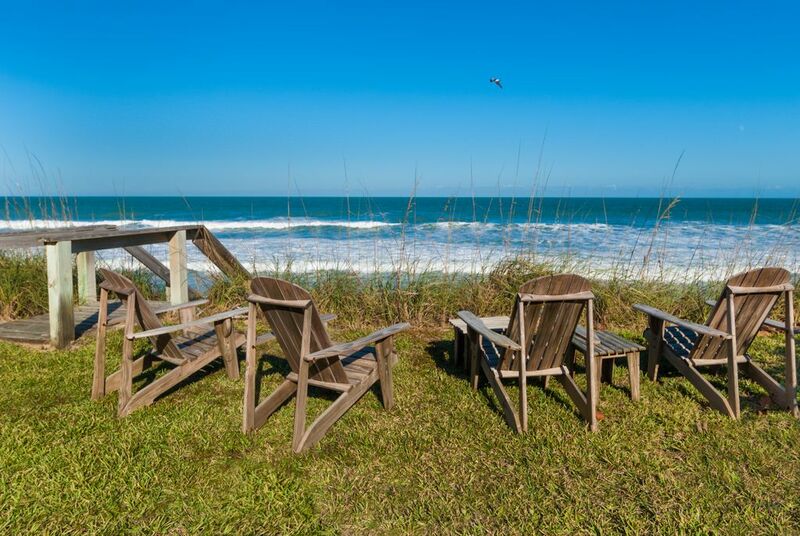 The Beach Cottage is conveniently located on Hwy A1A between Sebastian Inlet and the center of Old Melbourne Beach. Absolutely pristine virtually private beaches where you can spend the days fishing, swimming, and relaxing. The cottage is located directly on the ocean so enjoying your morning coffee and watching the sunrise is a highlight. If your interest include shopping and museums Melbourne has quite a few to offer and Sebastian Inlet has a treasure and fishing museum. There are many wild life refuges and sanctuaries to enjoy on bike, kayak or walking. Vero Beach is a short ride down the coastal highway where you can enjoy shopping, fine dining, and several spas. If the large resort parks are your interest Disney and Orlando are a short ride across the beach line. In 90 minutes you can be in the heart of Orlando. The Cape and SPACE are located about 45 minutes north. For the fisher person the area provides world class surf fishing and there are several charter services available for river and ocean fishing. This truly is a slice of Paradise! Notes Pets: individual basis: breed, age, size. Required proof of vaccinations flea/tick control pets crated when not with owners. Pet fee assessed at owner's discretion Rates published are subject to change, and no reservation is guaranteed until rental agreement is signed and payment is confirmed. Premium Holidays Labor Day, Thanksgiving, Christmas, New Year, Easter, Memorial Day, Fourth of July Cancellations within 60 days of arrival: refunds granted if/when the cottage is re-booked. The amount of refund is at owner's discretion.